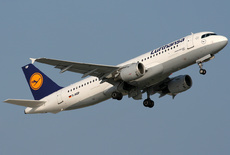 Because of the weather associated with hurricane Emma, on 1 March 2008 a Lufthansa Airbus A320 left Munich Airport (MUC) on a scheduled flight to Hamburg (HAM) at 12:31 about two hours behind schedule, with a crew of five and 132 passengers. Given the ATIS weather report including wind of 280°/23 kt with gusts of up to 37 kt, during the cruise phase of the flight the crew decided on an approach to Runway 23, the runway then also in use by other traffic. During the approach to land, the aerodrome controller gave several updates on the wind. Immediately prior to touchdown, the wind was reported as 300°/33 kt, gusting up to 47 kt. At the time of the decrab-procedure there was no significant gust. - The sudden left wing down attitude was not expected by the crew during the landing and resulted in contact between the wingtip and the ground. - During the final approach to land the tower reported the wind as gusting up to 47 knots, and the aircraft continued the approach. In view of the maximum crosswind demonstrated for landing, a go-around would have been reasonable. - The terminology maximum crosswind demonstrated for landing was not defined in the Operating Manual (OM/A) and in the Flight Crew Operating Manual (FCOM), Vol. 3, and the description given was misleading. - The recommended crosswind landing technique was not clearly described in the aircraft standard documentation. - The limited effect of lateral control was unknown. D-AIQP, the accident aircraft, over 2 years after the accident, seen at Frankfurt/Rhein-Main AB International Airport (FRA/EDDF), Germany.